A leading Welsh businesswoman has said she is convinced Brexit uncertainty is stalling business growth. Laura Tenison, founder of JoJo Maman Bebe, said consumer confidence was at an all-time low. 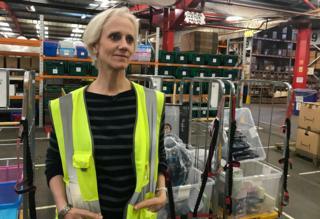 The clothing and accessories company has been growing at 20% a year and has the capacity to send out 6,000 parcels a day, but is now down to about 2,000 a day. She said it has been "extremely tough" for the retail sector. "Until about six months ago we were doing well, we continued to grow, but recently the lack of consumer confidence is so apparent, people don't know when their job stability is going to be given back to them," she said. Ms Tenison said she was sure Brexit uncertainty was to blame because the company does its own business analysis. "They're just not buying as much and looking at their spend more carefully - they're not coming in to store as often and it's online too." She said people were concerned about spending, taking out loans and job security. Ms Tenison said the company - which has 250 of its 1,000 employees at its Newport headquarters - has put business development on hold in Ireland and Germany and was "battening down the hatches". Her Brexit preparations included delivering early to clients in Europe and the USA, halving the number of store openings, and investing in IT and AI. She also bought in advance the amount of foreign currency they usually use - to buy products - for a whole year. Workers are also uneasy about the future. Dave Dabenette - who voted leave - said he was fed up with the debate and wanted to get out as soon as possible, with Britain looking after its own borders and tariff arrangements. "If we have more time maybe they can iron out the problems with the Irish backstop," he said. "It must be a nightmare for companies - younger people need stability." Another worker Carly Bond said she was nervous because she does not know what will happen - not only is it quieter at the factory, she is not spending much money herself. "I definitely worry for the future of my children - money-wise, buying their own house and jobs," she said.